Description: Manifest begins the climb up Cajon Pass as it passes through Devore. Title: ATSF SD40-2 No.5104 Provo,Utah January 24,1995. Description: ATSF SD40-2 painted up in the ''Bluebonnet'' Scheme shoves coal empties into the former D&RGW east pass at Provo sandwiched between another Santa Fe SD40 and a Union Pacific SD40-2. 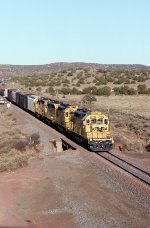 The train is a returning coal export train from Los Angeles to the Acco Mine near Grand Junction,Colorado for a refill.